In opposition to the Greek, Roman space is something interior, in which the person can be. Buildings are closed. Beauty and sumptuous are mixed with practical. In addition, architects are engineers and urbanites too. This can be seen in the importance given to cities as the economic and political centre. The function of the urbanism is triple: solve the problems of the development of the cities (water supply, sewer system, transport, squares, defence); the psychological effect of impressing the rest of the world and, finally, to ease the colonization of the territories they dominated. The solution given by urbanism is rational, quick and clear. 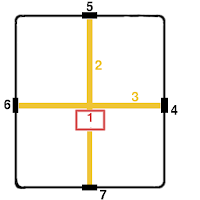 They adopted the squared plan, with two axis that cut each other perpendicularly (cardum and decumanus) in which integration appears the foro or place where public buildings are concentrated. Its origin is the military camp and the hypodamic plan designed by the Greeks. Romans used the semicircular arch and the vault to cover the spaces. This solution did not eliminate the lintel. In some cases they put the lintel over the arch, creating effects of great dynamism. The vault system is varied: rib, barrel, semi-spherical, quarter sphere, and others. It is especially important the use of the dome. Romans assimilated Greek forms: they adopted the three orders even when in a more ornamental than functional way. Frequently they combined them in a superposition glued to the wall with decorative value. In addition, they created two new orders: the Tuscan that is similar to the Doric but without lines in the shaft, and the composite, that combines Ionic and Corinthian in the capital. Materials are ashlar with different combinations, brick and mortar or concrete, a poor and cheep material formed by mixing different stones and sand. It was called Opus cementitium. This material allowed them to built colossal and strong constructions that were decorated with paintings, mosaics or by covering them with marble. Religious architecture: the temple. Religiosity was based on a complex mythology in which they combined their own goods with those of the countries they dominated. Besides, they practised a domestic religion, with familiar gods (manes and lares) to which they offered their respect. 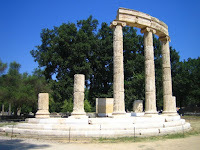 The model of temple follows the Greek plan with some differences: there is only a portico with columns in the façade where there is the only entrance to the temple. 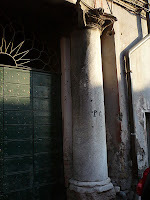 It tends to be pseudo perypteral, this is, columns are linked to the walls around the building. It has the triple Etruscan cella, completely closed by blind spaces between columns. The stairs around the temple are substituted by a high podium that is elongated in the façade with the stairs. 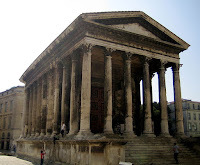 Examples are Fortuna Viril and Maison Carrée. They were also other kind of temples, with circular plan, similar to the Greek tholos, as Vesta’s Temple, but the main of these construction is Agripa’s Pantheon, devoted to all the gods. Civilian architecture: Roman genius had its maximum expression in public buildings: basilicas, baths, theatres, amphitheatres, triumph arches. 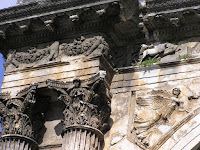 They tended to be located around the forum. The basilica was an administrative and commercial building. It was a meeting space. The model was inherited from Greece. 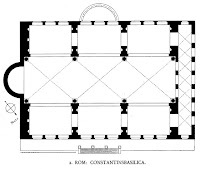 It has rectangular plan and consists of a central nave (with windows in the upper part to illuminate the interior) and two smaller at both sides, lower and narrower, separated by columns. The wall of the end is semicircular, creating an apse. The cover was barrel vault. Example: Majencio’s Basilica. Baths are buildings created for hygiene and spare time. They are monumental with great variety of services: libraries, massage rooms, and the three main rooms: frigidarium for cold water, tepidarium for warm water and caldarium for hot water. Besides they were changing rooms called apodyterium. There are concrete buildings, covered in marble, of great proportions. They were covered with semi-spherical and ribbed vaults. Example: Caracalla’s Baths. Theatre. It is similar to the Greek but the essential difference is that it was not carved on a hill, but artificially built, with the grades standing on a vault system. The orchestra was reduced to a semicircle because of the more reduced importance of the choir in Roman plays. The scene consisted of three lintelled bodies with rich decoration of columns and sculptures. Example: Merida, Marcelo. Amphitheatre was a building created by the Romans. It is the result of the fusion of two theatres. It was designed for gladiators’ combats and spectacles with wild animals. It usually had circular or elliptical plan, surrounded by grades to ease the vision from any point. Below the sand there was a complex net of corridors with cages and different rooms for the service. The most important is the Coliseum. Circus was designed for horse and carts races and also for athletic competitions. It is an adaptation of the Greek stadium. Its plan is long and it has a central element or spine, that divides the sand longitudinally. It was surrounded by grades. Example: Maximus. Commemorative buildings: triumphal arches and columns. They were used to remember some exploit of their emperors or generals. They were located in the forum, in the crossings or in any other important place. They had propagandistic function. Triumphal Arches. They have the shape of a city door but isolated from the rest of the wall. It can have one, two, three or more. Sometimes they can have squaren plan with four façades. They combine arch and lintel with a lot of decorative elements such as Corinthian columns and relives narrating the adventures of the person to whom they are devoted. A majority of them were built in stone or marble. Examples: Tito, Septimio Severo, Constantino. 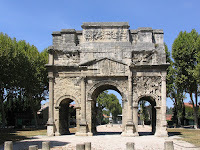 Commemorative columns were of Roman invention and their finality is the same of that of the triumphal arches. Their shaft is covered with historical relieves distributed helicoidally. At the top they have the sculpture of the emperor honoured in them. Examples: Trajano, Marco Aurelio. Tombs. 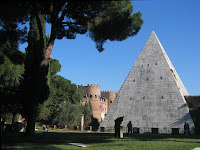 There were two funerary practises in Rome: inhumation and incineration. In the last case it was common to dig galleries and in the walls there were spaces for putting the urns. In the case of important families or citizens they had especial buildings in form of temples, towers, pyramids or circles. Example: Adrian’s Mausoleum. Public works: bridges, aqueducts, reservoirs, and paved roads. There are military and commercial works, necessary for the dominium of the empire. There were an instrument for romanization and an example of their genius. The house. Popular house had different typologies. 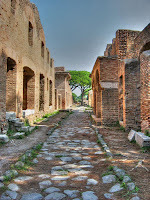 The buildings of the cities had several floors and they were called insulae. Rich families had domus in the city or villae in the countryside. These two types were quite similar in room distribution, with a courtyard or atrium; around it there were the rooms or cubiculi and the dinning room or tablinium. At the end there was normally a garden. With the time it was modified, the courtyard was surrounded by columns and it was open at the top and it had a central pond for containing the rain. Apart from these in some cases there were palaces that were conceit as real cities to serve the emperor.